Ken Mannion. DG Fossil preparation Grinder. Ten diamond burrs aimed specifically at fossil preparation. Max air pressure 40psi. Weight of pen body 150g. 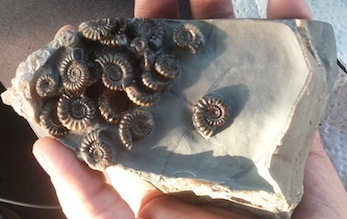 A highly pyritised and fissured block of ammonites prepared in high relief using a DG grinder. 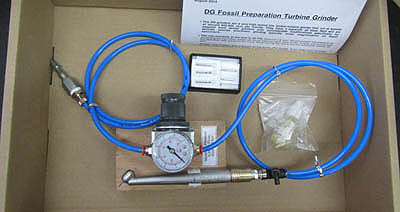 The DG high speed turbine grinder is one of our specialist Fossil Preparation tools. Typically not a fossil preparers first tool, they are a welcome addition to an advancing preparers arsenal. Extensively adapted by us from high build quality Japanese dental handpieces they can be run from normal air compressors rather than multi serving dental units. The water flow over the burr required for dental work replumbed and replaced with an air flow and the drive switching conveniently moved to the actual tool. Independent precise airstream over the grinder head for clear working. Low air pressure operation from 20 PSI(1.5bar) to 40 PSI(2.5bar). Precise worktop regulation and inline operating handpiece switching. Easy to change FG(Friction Grip) burrs, achieved in seconds.